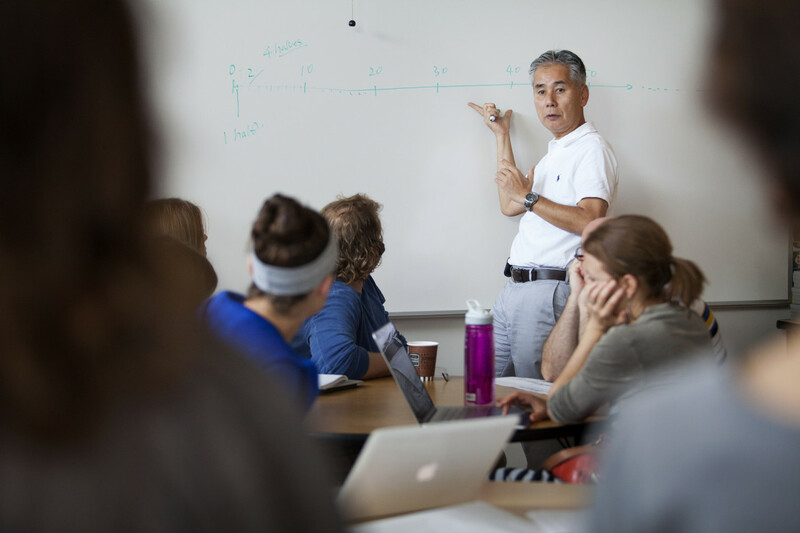 Dr. Akihiko Takahashi gives feedback to a group of math teachers presenting unit plans during the Lesson Study Alliance workshop at Dr. Jorge Prieto Math and Science Academy on Thursday, Aug. 7, 2014. On a sunny August morning, several dozen teachers from a range of schools crowded into the cafeteria of Prieto Math and Science Academy in Belmont-Cragin. No children were in the room. On this day, teachers were the students, and the class was the Lesson Study Alliance’s summer institute. In one corner, teachers from South Shore Fine Arts Elementary School presented their plans for teaching two-step word problems involving addition and subtraction to third-graders. Over several days, they explained, one teacher would go over addition and subtraction problems separately. On the sixth and final day, she’d combine both concepts into a single word problem about someone collecting and discarding rocks while on a nature walk. The other teachers in the cafeteria asked how they thought students would respond, including the kinds of wrong answers they might offer. They also discussed the best order in which to write out students’ answers on the board, and how that might be important for future lessons on the order of math operations. Teachers and CPS leaders say workshops like those offered by Lesson Study Alliance are an example of quality professional development that both improves their teaching and fulfills requirements for state certification renewal and salary advancement. But with limited time and resources, many teachers say it’s harder to get access to good PD during the school year. Even though 10 days for PD are built into the calendar year, teachers say it’s simply not enough. In some cases, time is eaten away by administrative announcements or other school business – especially at schools that have cut support staff that used to handle those duties. That means educators have to be creative to find and take advantage of opportunities, by applying for them over the summer and sharing with colleagues who don’t get to attend. Mariel Laureano, the principal at Prieto, for example, offered to host the summer Lesson Study institute in exchange for allowing teachers from her school participate for free. “It’s a win-win for everybody, as it really deepens their understanding of learning overall so that they want to be here,” she says. In the meantime, CPS is trying to improve in-school opportunities by using a model of teacher-led PD. The district says the shift, which began two years ago, has less to do with saving money than it does taking advantage of the trust teachers have in their own colleagues. The district trains so-called “teacher leaders” from each school on specific skills or curricula, and the teacher leaders are then expected to go back to their schools and share what they’ve learned, explains Susan Kajiwara-Ansai, executive director of Professional Learning at CPS. The model has its pros and cons, teachers say. On the one hand, teachers can learn more from colleagues than outside providers because they have an intimate understanding of the local context and student body. “It can be a powerful thing because of the local knowledge and relationships,” says Mark Sidarous, a biology and chemistry teacher who has done trainings for his colleagues at Community Links High School. But on the other hand, many teachers said trainings are limited to what people in the building already know or happen to learn at one of the district’s trainings. And it’s extra work for which teachers don’t get paid. To avoid burdening the same teachers repeatedly with extra work, CPS asked principals to develop plans for one of the district’s learning priorities, the Common Core, during a three-day summer training. Annette Gurley, chief of the Office of Teaching and Learning, says this should have a positive impact on the overall professional development of teachers. At Wadsworth Elementary, administrators and staff spent part of the summer developing a plan to encourage more teachers to lead trainings among their colleagues, especially on STEM (science, technology, engineering and math) subject areas. The idea is not only to spread knowledge, but to build camaraderie and trust in a school that has had a tumultuous past year. Wadsworth was recently designated a STEM school and last year welcomed students from closed schools, at the same time making a move to the former Dumas Elementary building when a charter high school took over the former Wadsworth building. Many teachers seemed disinterested last year in learning more about STEM. “But when teachers were motivated and [got the chance to] train others, they would come in and share their personal narratives, and that was really the key that broke down some of the walls,” says Michelle Warden, the school’s STEM technology specialist. The Wadsworth group worked on the plan to promote teacher-led training during the recent Summer Design Program, a project of The Chicago Public Education Fund. The Summer Design Program brought teams of teachers and principals from 40 schools together to find solutions for specific school challenges. About 80 schools applied for the free summer program, which itself was a form of professional development that can count toward teachers’ requirements for certification renewal. Heather Anichini, president and CEO of The Fund, says she was pleased at the level of interest even though the program is only in its second year. On their own time, educators are also seeking professional learning opportunities around the Common Core State Standards and the Framework for Teaching, on which teachers are now being evaluated, says Lynn Cherkasky-Davis, who heads the Chicago Teachers Union Quest Center. Meanwhile, the district is trying to make it easier for networks and schools to vet outside professional development providers. Earlier this summer, CPS issued a broad request for proposals from PD providers that could support the implementation of some of the district’s top priorities, including the Common Core and Framework for Teaching. Principals and network chiefs will be encouraged – though not required – to use the approved vendors. Last year, CPS issued a similar but more narrow RFP. Lesson Study Alliance, which offered the summer institute at Prieto earlier this month, was one of 19 providers that made the cut. Thomas McDougal, executive director of the organization and a former teacher himself, says what makes the “lesson study” model so useful to other educators is the opportunity to practice lessons in a controlled setting before taking them into the classroom. The RFPs also help the district itself to know what kinds of professional development opportunities are offered across CPS and how much is being spent, which is a challenge for any school district. In addition, district officials say the process will ensure providers charge schools the same rate for the same trainings. Gurley says giving principals a go-to “menu” of pre-approved PD providers should save them from wasting time doing their own research.